L. Brankovich, Y. Lin and W. F. Smyth, eds. The International Workshop on Combinatorial Algorithms was established in 1989 as the Australasian Workshop on Combinatorial Algorithms. As a consequence of the workshop's success in attracting mathematicians and computer scientists from around the world, it was decided at the 2006 meeting to go global, to change the workshop's name, and to hold it in appropriate venues around the world. The workshop supports basic research on the interface between mathematics and computing, specifically * Algorithms & Data Structures * Complexity Theory * Algorithms on Graphs & Strings * Combinatorial Optimization * Cryptography & Information Security * Computational Biology * Communications Networks and many other related areas. 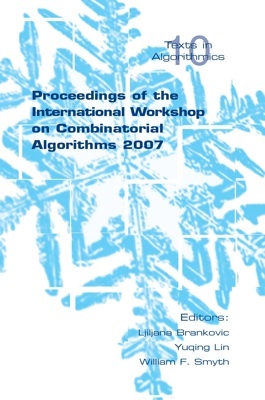 This is Volume 1 in the series of IWOCA proceedings.